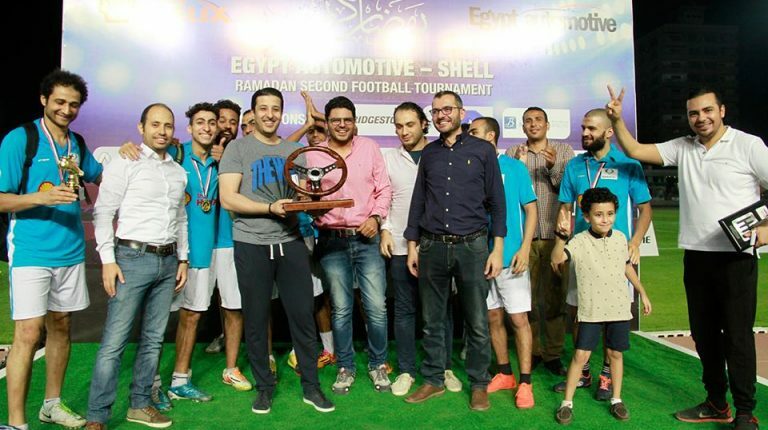 The events of the second Ramadan tournament of the automotive sector, named “Egypt Automotive Shell” were concluded. It was held over the course of 14 days and included competition between automotive companies on the fields of the Olympic Centre in Maadi. Twenty teams participated in the tournament, including Ford, Ssang Yong, Subaru, Seat, Volkswagen, Jaguar Land Roover, Renault, GB Auto, Hyundai, Shell, Auto 21, Al Tawfik, Code 96, Abo Hetta, Geuishi Motors, Club World, Abaza Auto, Elite Group, and the Borsa – Daily News Egypt team. Forty-eight matches were held, in which the participating teams were divided into four groups. Each group included five teams. 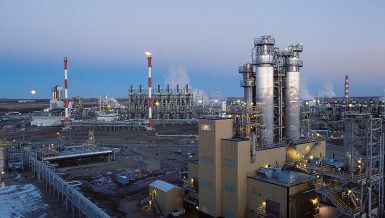 The first and second team of each group were qualified to the eight round, the semi-final then the final round. Egypt Automotive Shell honoured Coach Moustafa El Rabbas, also known as “Rabsou,” the player of Ssang Yong, as the scorer of the tournament with a total of 20 goals, in addition to Coach Gaber Salem, the player of team Abo Hetta, as the best player in the tournament, alongside with Islam Gad as the best goalkeeper. Participants and spectators spent fun Ramadan nights, as the competition saw strong competition by the participating teams that managed to turn necks since the opening of the tournaments in the presence of the leaders of automotive companies at the opening ceremony, followed by Ramadan Suhoor. On the closing day of the tournament, leaders of the companies, as well as marketing and sale heads, were present during the finals, which were popular in the automotive field. The families of the players were also present to support them. The end of the tournament started with a match to determine winners of the third and fourth places. The teams playing were Renault and GB Auto. Renault team won by 7-1. Then the awaited moment came and the final match between Ssang Yong and Abo Hetta was played. It saw vicious competition until the referee ended the game, with Ssang Yong team winning the tournament for the second year in a row by five goals against one. Once the match was over, the participating teams were honoured. Mohamed Aboulfotouh, the CEO of Egypt Automotive; Mahmoud El Hadary, the manager of Shell’s authorized service centres, in addition to Mohamed Magdy, the regional manager of the passenger cars department at Bridgestone. Additionally, GB Auro, Beltone, and Bridgstone were honoured for being part of the tournament. 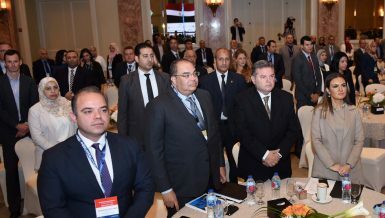 The representatives of these companies were presented the Egypt Automotive shield. Egypt Automotive and Shell have also presented honouring shields to all the companies that took part in the event, including Abaza Auto. Mohamed Ahmed, the head of Credit Department at Abaza was the one to receive the shield in addition to the vice chairperson of Abo Hetta, as representative of his company. Additionally, Rania Adel, the head of PR received the shield on behalf of Auto 21, while Mahmoud El-Aidy, the head of HR at GB Auto received the shield on his company’s behalf. Mahmoud Abdelmoteleb, the head of Customers Service, at Geushi Motors received the shield on his company’s behalf, in addition to Amr Mohamed, the chairperson of Code 95, and Mohamed Talab, representing Land Roover, and Ramy Gad, representing Renault as its Director General, and Medhat Ismail representing Seat, in addition to Mahmoud El Shamy, the head of the sales sector at Ssang Yong, alongside with Osama Watany, the head of sales of Volkswagen. The arbitration team was also honoured, headed by Karim El Saeed. The tournament’s shield was given to Tamer Ramadan, the general supervisor of the tournament, to thank him for his efforts to organize the tournament. At the end, the members of Renault team, who came third, received the bronze medals. The team of Abo Hetta, who came second, received the silver medals. The honouring moment for winners of the first place, the Ssang Yong team, included giving them the gold medals and the tournament’s cup. Ahmed Aboulkhaff, the chairman of Arabiat, the agent of Ssang Yong in Egypt, was keen on holding the cup of the tournament and celebrating the win with his team. At the end of the tournament, Mohamed Aboulfotouh, the CEO of Egypt Automotive, in addition to Wael Azmy, the head of HR at the Bavarian Group, Mahmoud El Hadary, the Director of Agencies and authorized service centres at Shell, and Mohamed Magdy the regional head of the passenger cars department at Bridgestone announced the surprise of the Super Cup tournament. It is a match between the team that won the Egypt Automotive Shell tournament, and the team that won the Bavarian Group tournament. There will be several rewards for both teams.